Hello everyone, today I will be talking about cat toys for indoor cats. There are a lot of different types of cat toys and people usually cope with which one to choose. So they end up choosing something that is not right or in some cases they don’t choose anything at all. But cat toys are important for your cats for many reasons. Therefore I will recommend my personal top 10 cat toys for indoor cats. I hope you enjoy the article and get a good sense of which toy is the best choice for your cat. Why are toys important to your cat? First of all, cats can get bored if they don’t have something to do. They are very energetic and curious animals and they need something to fulfill their time. Too much self-grooming. Too many naps. Baiting other pets or fighting with them. Eating too much. Listless behavior. Damaging household items. Those are all signs of cat boredom. If you recognize your cat in these behaviors, it is time to buy some cat toys. Cat toys can also be used for exercise. You know that awful feeling when you sit around all day doing nothing? You get that feeling of being sick and weak. The same way goes with cats too. Most people think they are cuddly and sleepy all day and that that is their choice. But, that is not the case. Cats need to have their daily dose of running and wildness. It helps them feel good and it helps to improve their overall health. Cat toys are perfect for that. They will raise their curiosity and provoke them to move and run. Cat toys are fun and they make your cat feel good. You can compare that feeling with humans. We like playing games and having fun too. Just imagine how would you feel without any fun in this world. That is why, if you love your cat, you should make sure they have a time of their lives. Cat toys will definitely ensure that. Another crucial aspect is anxiety relief. When people are under a lot of stress they go to the gym, running, exercising or whatever they like. The thing is that your cat can’t do squats or punch a boxing bag. That is why cat toys are important to them. They can help them release stress and anxiety. If your cat is unable to do so, it can get aggressive and it can even start urinating all over the house. Last but not least is the bonding time. This aspect is important to cat owners too. Cats are not as friendly as dogs and you can’t always take them for a walk and bond with them. Cat toys can help you with that. Find a toy that is perfect for interaction between you and your cat and you will both have a wonderful time that can last for hours. How to choose a perfect toy for your cat? Choosing the perfect cat toy for indoor cat is very important. Not all the toys will catch your cats interest and you don’t want to go around wasting money for something that your cat wont even use. That’s where I made some mistakes when I first got a cat. I was searching for toys in stores and online and I was always buying the first thing that caught my eye. At the end, for some of the toys, my cats weren’t interested at all. Some of them even scared them. Also, you need to realise that one perfect toy is better than hundred not so good ones. Thus, if you are on a budget, you should save money and buy one great, maybe more expensive toy. Those little, cheap toys have lower quality and they can easily break. For the things that move you can make a furball or just take a ball of strings and throw it around. If you see your cat interested and running around, catching it, then you should look for toys with similar effect and electronic toys. To test if your cat likes feathers just take a feather and attach it to a string. Thigh up that string somewhere high and see if your cat will jump to reach it. You can see it on your furniture and maybe even on your arms if your cat likes scratching. I know my cats love it! To see if your cat likes to hide and play in cramped spaces just put a cardboard box on the floor and look at their reaction. You can drill some holes in it and see if your cat curiosity is awakened. Catnip is used to stuff cat toys, like for example balls. You might not have catnip at home but that’s all right because catnip is a sure thing. In my opinion you don’t have to sample that, your cat will surely love it. Just like humans, cats have different personalities too. You want to know if your cat is a hunter type or maybe a shy type. Sample toys can give you some clues in finding out your cat interests and personality. Hunter cats love to explore, run and catch things. To them, everything that moves around and everything that make sounds is perfect. In contrast to them, shy cats don’t like things that make sudden sound effects. Those effects wont interest them, they will just scare the cat and make her go away and hide. For this kind of personality, you should look for quiet toys and toys with no sudden moves. Perfect thing for them are cramped hiding spaces where they can play, and toys that gives them full control. 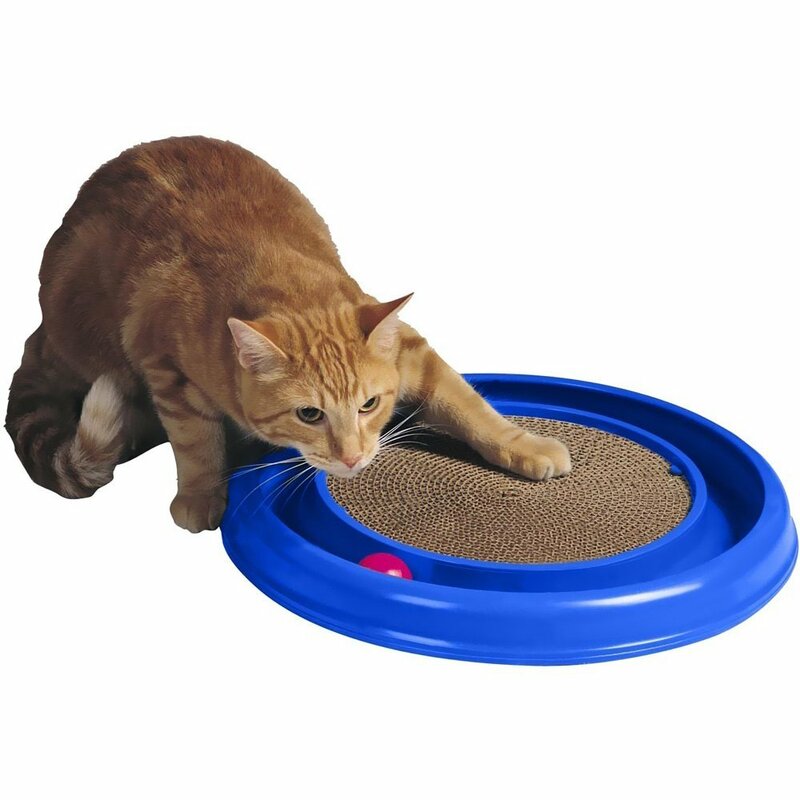 This toy is perfect for cats because it is made with pedigree and it is constructed to keep cats entertained for hours. It includes different modules with games to stimulate all cat senses. You just put a few pieces of treat inside and watch your cat strategize their way to it. This toy is great for fast eaters because your cat will have to struggle a little more to get to their food. Another good thing is that, no matter the fact that it is made of plastic, it is heavy so cats can’t drag it around. Buyers are pointing out that it’s parts are removable and that entire thing is dishwasher safe. Most important comments are that customers cats love to play with it. You can buy Trixie cat toy here. This toy is perfect for cat exercise. Roller toy is a fun three-level tower with three colorful balls. Balls swirl around the tracks to mimic natural prey. Your cats will spend hours and hours entertaining themselves. Great thing is that this toy is good for multiple cats at once and even though it is lightweight, balls wont come out easily. All buyers confirm that. They also point out, and that is relevant if your cat is shy type, that you can hear balls rolling, but it is not too loud. You can buy Cat roller toy here. This is a heavy toy box with holes to hide toys inside. It usually comes with two balls, but you can even hide some treats or catnip in it or some other toys of your choice. If you decide to use other toys you must watch out that the toy size is matching to holes on the box. Peek a prize cat toy box is perfect for curious cats and it is completely safe to use. It also awakens cats natural desire to hunt. 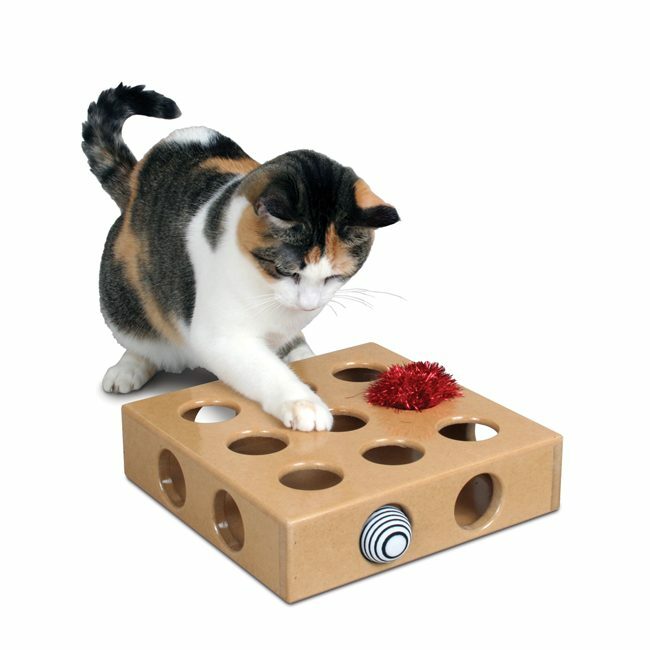 With this toy, you don’t have to worry that your cat is going to be bored when you’re not at home. But, if you have a kitten, I wouldn’t recommend it because holes in the box are too big for them and they can get stuck in it. You can buy Peek a prize cat toy box here. 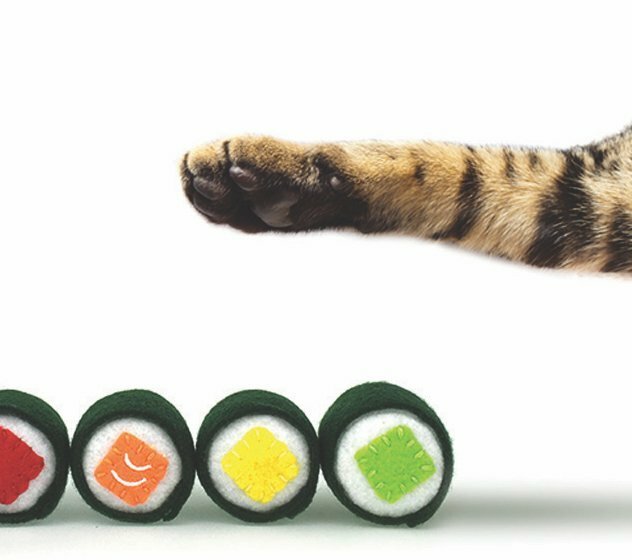 Set of sushi toys is perfect for cats and owners too because they are a part toy, part decor. They are absolutely adorable! Sushi toys stimulate cats natural instinct to explore and play. They are usually filled with catnip or tiny bells. Your cat will really love it! They are small or medium-sized so your cats can bite it and carry it around in their mouths. 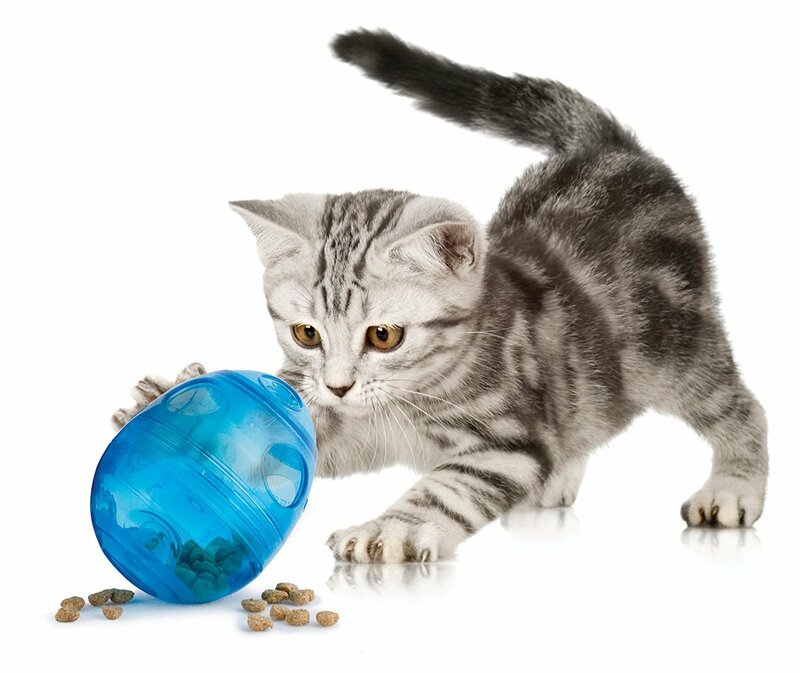 Although they are really quality you should keep an eye on your cats while they play with it. That is so because they are plush toys so they are not indestructible. You can buy Sushi cat toy here. You can also buy this one. Toys like this are perfect for cats that need to work on their weight. All you have to do is fill this egg with dry food and let your cat do the rest. The egg has three holes on it, but you can customize it as you like. In other words, you can open only one, two or all three holes. Your cat will play with the toy and as the toy rotates the food will come out once in a while. This will make your cat eat slower and the food that falls out will be like a prize. All in all, slower eating and encouraging movements is a winning combination for weight loss. Costumers are pointing out that the toy is hard and less breakable and one of the buyers is perfectly happy because his cat lost 3 pounds using this egg. 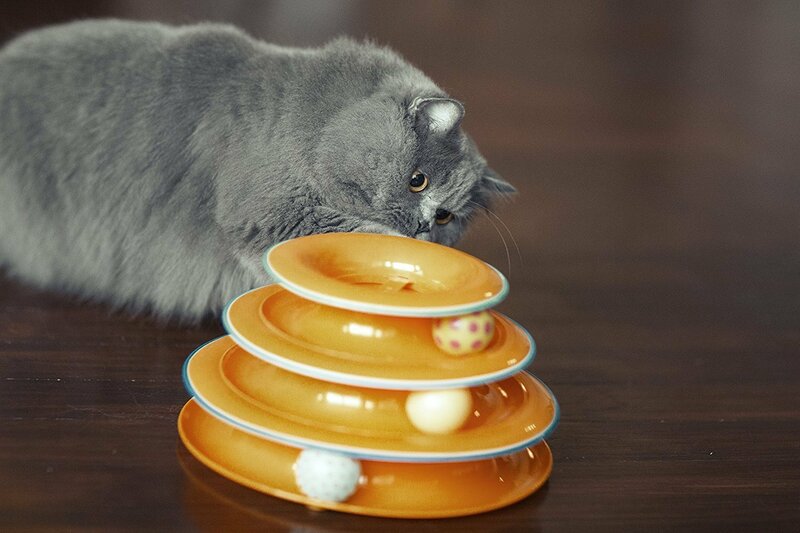 You can buy Egg cersizer interactive toy and food dispenser here. You can buy Scratcher toy here. This electronic toy is perfect hide and seek game. 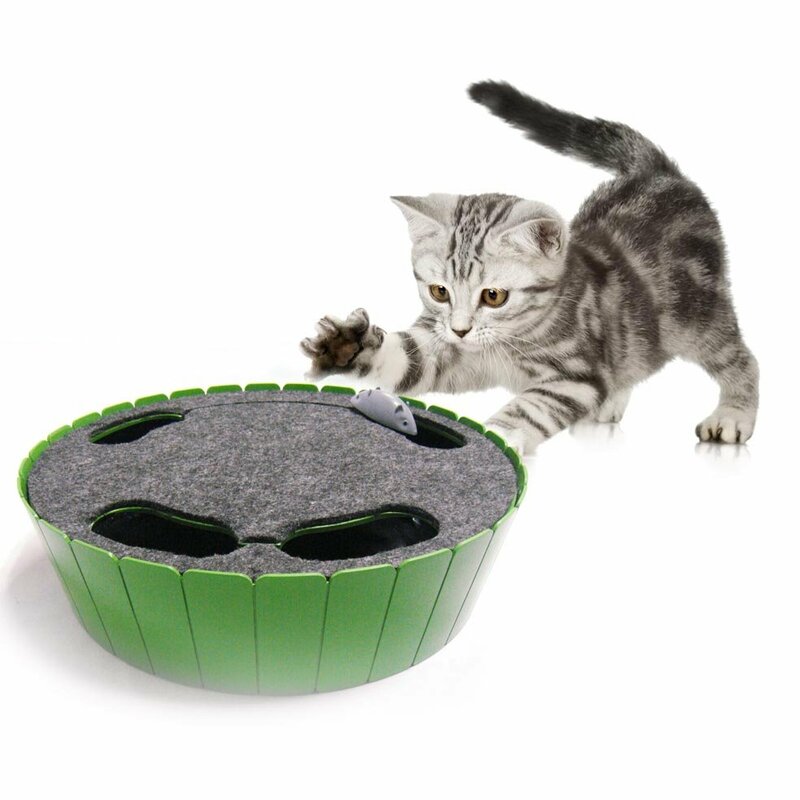 It will definitely capture your cat‘s attention and awaken its hunter instincts. It consists of a durable plastic construction and a mouse. The construction has holes in it and when you turn on the toy the mouse starts jumping out of one hole to another. You can even adjust speed (slow or fast) and reverse the direction of mouse movements. Buyers are happy with this toy because it provides hours of fun, it is quality and not easy to break. They also say that it is hard for their cats to separate the mouse from the construction. On the other hand, there is a downside to this toy and that is battery duration. You can buy Pawaboo electronic cat toy here. Similar to previous one, but another great electronic toy. It is automatic, interactive toy with a mouse that has random movements. Again, you can adjust speed. Mouse is reversing directions and hiding under obstacles. The cat will chase the mouse while it stimulates natural hunter instincts. You can buy PetSafe pounce pet toy here. 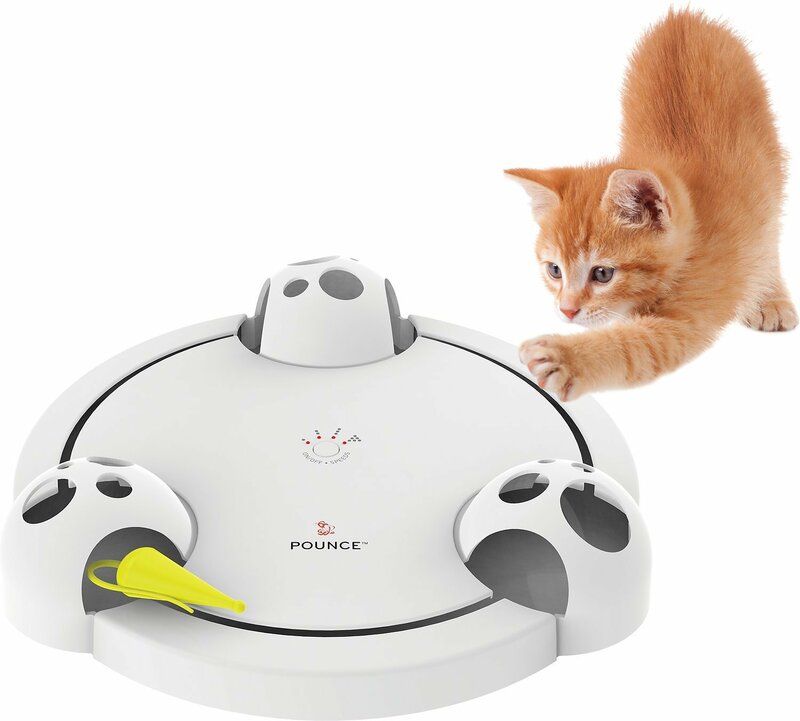 This toy is perfect for times when your cat stays home alone because it will interact. The toy automatically rolls on its own and changes directions when it gets to obstacles. It has lights on it that will attract your cat. Those lights are safe so it surely wont hurt your cats eyes. 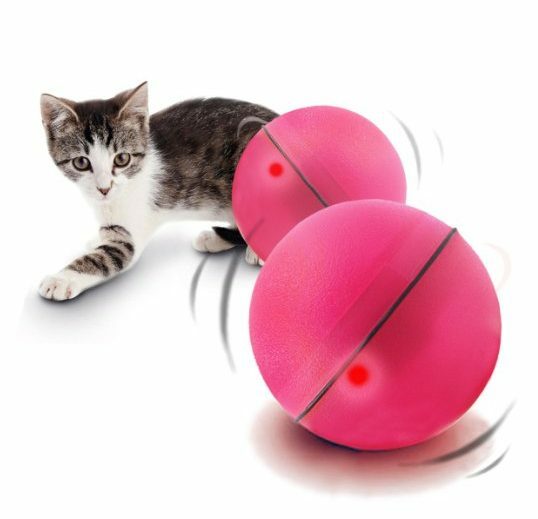 This toy can also help your cat exercise because your cat will follow the ball all around your home. To point out, this toy might not be so good if your cat is a shy type. Balls sudden movements and lights can scare them but it is important to realize that your cat can also get used to it over time. You can buy Interactive automatic rolling light ball here. This three-way tunnels are great for hours of solo or accompanied fun. In other words, your cat will love to play with it on its own or in company with other cats. Moreover, this type of toy usually have swinging bell toys on every side of a tunnel to insure even more fun. My cats love to play with it together. They like chasing each other in the tunnel and hiding in it. You can say that they have their own daily round of hide and seek. It is important to mention that this toy is durable and washable. 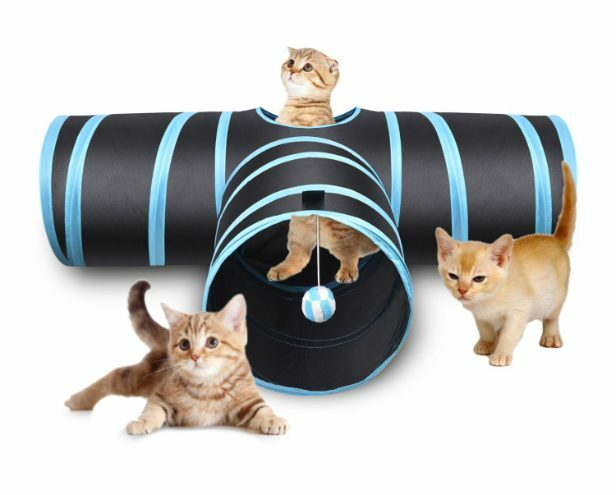 You can buy Three-way cat tunnel here. These cat toys for indoor cats are just some recommendations to help you view all the possibilities and to help you in search for a perfect indoor cat toy. Just remember, don’t rush with the search. Give yourself some time, try sample toys and keep in mind your cats personality and interests. If you already tried some of this toys and liked/disliked it, please leave a comment. Tell us your opinion so that other cat owners in search of a perfect fun for their fur ball can make a good decision. Cute cats need cute toys. I. WANT. ALL. OF THOSE. CATS. I would definitely buys these if my cat is still alive, I really misses him. My cats love any toy that has catnip it in lol XD They also like the sparkly balls.